Dory Deli is opening its doors next to the Newport Beach pier in January. The restaurant's name references the area’s historic fish market, and is slated to serve up a list of breakfast items and salads, along with a host of traditional and artisanal sandwiches, including several vegetarian offerings. The eatery will also feature a wine and beer list highlighted by the presence of several local craft brews. Breakfast, Lunch, & Dinner daily. Dory Deli, 2108 3/4 West Oceanfront, Newport Beach, CA 92663, 949-220-7886. The chef-driven, farm-to-table concept Tempo Urban Kitchen is now open in Brea. The eatery’s executive chef, Derrick Foster, comes to Orange County by way of New York City and Colorado, and delivers a menu of modern American and global cuisine built around ingredients that are fresh and scratch-made --- all the way down to the salt. The venue will also feature an eclectic list of handcrafted cocktails, craft beers and international wines. For more information, visit www.tempourbankitchen.com. Lunch & Dinner daily. Tempo Urban Kitchen, 1060 Imperial Hwy., Brea, CA 92821, 714-529-2900. 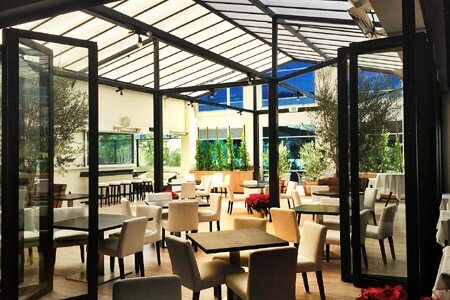 Eats Kitchen & Bar, Orange County’s latest foray into the swelling gastropub genre, has opened in the newly renovated Hotel Irvine, formerly the Hyatt Regency Irvine. Executive chef Jason Montelibano, who previously oversaw the kitchen of Chapter One: The Modern Local in Santa Ana, has cobbled together a small plates menu consisting of updated versions of classic comfort food. The restaurant, which will be open for breakfast, lunch and dinner, also features a host of craft beers and wine flights. For more information, visit www.hotelirvine.com. Breakfast, Lunch, & Dinner daily. Eats Kitchen & Bar, Hotel Irvine, 17900 Jamboree Rd., Irvine, CA 92614, 949-230-4452. The contemporary Chinese restaurant Twenty Eight opened its doors in the heart of Irvine’s original business district on December 10, 2014. The restaurant is the brainchild of executive chef and partner Shirley Chung, whose pedigree includes an appearance on Top Chef and a successful stint as executive chef at China Poblano by Jose Andres. Chung promises to bring regional Chinese dishes to the venue, made with local seasonal ingredients and progressive flavors. Twenty Eight, 19530 Jamboree Rd., Irvine, CA 92612, 949-852-2828. Lillie’s Q, the Chicago-based restaurant concept known for its barbecue and Southern side dishes, has opened an Orange County location. The venue is located in downtown Brea. In addition to serving up Southern cuisine and barbecue entrées, such as slow-smoked pork shoulder, baby back ribs and tri-tip, the venue is also partnering with neighboring restaurant TAPS Fish House & Brewery to feature specialty craft beers. Lunch & Dinner daily. Lillie's Q, 240 S. Brea Blvd., Brea, CA 92821, 714-482-2001. SOCIAL Costa Mesa is putting together a special Brunch for Lunch program throughout January. Every Sunday during the month, the restaurant will be donating $2.50 from each brunch entrée purchased to Project Hope Alliance, a local non-profit organization focused on ending childhood homelessness in Orange County. The brunch itself features several Southern-inspired dishes crafted by executive chef Jeffrey Boullt, and the venue’s bar director has created a host of special brunch cocktails to go with these entrées. SOCIAL Costa Mesa, 512 W. 19th St., Costa Mesa, CA 92627, 949-642-2425. El Cholo closed the doors to the Irvine location at the end of 2014. However, the restaurant will be resurfacing in Corona Del Mar, as it will be taking over the location previously occupied by Landmark. The restaurant’s new locale is slated to open in the spring of 2015. El Cholo, 5465 Alton Pkwy., Irvine, CA 92604, no phone. OC Wine Mart has closed its Irvine location, citing a sharp increase in property rent as the reason for the shuttering. The Yorba Linda location of the popular wine bar and market will remain open, and will continue to offer a selection of artisanal cheeses, meats and other snacks, in addition to its enomatic wine-tasting service. OC Wine Mart, 2272 Michelson Dr., Irvine, CA 92612, no phone.